Welcome to Big Smile-Big HeArts! Big Smile-Big HeArts is the non-profit arm of Big Smile Entertainment. Big Smile Entertainment is most proud of their on-going dedication to giving back to the community. We have mounted a concert to benefit Aids Research on Broadway in NYC, and the company performs daily for the elderly. 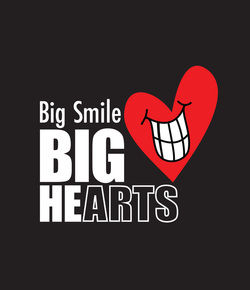 Big Smile-Big HeArts is dedicated to bringing Arts Programs, Education, and Career Development through the Arts and Awareness to Seniors, Children, Special Needs Persons and Veterans. The mission is to use the Arts as a vehicle to inform, empower, educate and mentor Children, Elders, Special Needs and Veterans. BigSmile-BigHeArts is a Non-Profit which was established to use the Arts to benefit Children, Elders, Veterans and Specials needs. The Arts can be a powerful tool to help build confidence, release stress and tone skills that would be beneficial in the work environment. The Arts can be used as a vehicle to address Bullying and other social issues that face our children, Veterans, Elders and Special Needs. Programs that we are currently working on are: School tours with interactive plays on Bullying, Recycling etc. We are developing Acting classes to help Vets with Post Traumatic Stress and classes to help Children with the fear of Public Speaking. We are working on Plays that combine young Children and Seniors which would promote mentoring, help children get over their fear of elderly and help the seniors feel vital. We are working to establish a workshop where Vets can write short plays, poems, songs, draw/paint or write stories about their experiences in the field. Then we would have an evening where we display and perform the end results. There are many other programs as well in the works.